We are celebrating our 6th anniversary, 5th in printed media. Not because of anything I do, but what we do together. Thank you for your support, and your contributions. Without all of you, none of this would be possible. Sorry, but the idea of any printed material burning makes me nauseous. Remember the LO is flammable too. Dee Martinez wrote: Sorry, but the idea of any printed material burning makes me nauseous. copies of the cover were burned. But why let facts get in the way of a good attack, eh. Great issue of the paper! It is almost an "Education Issue". 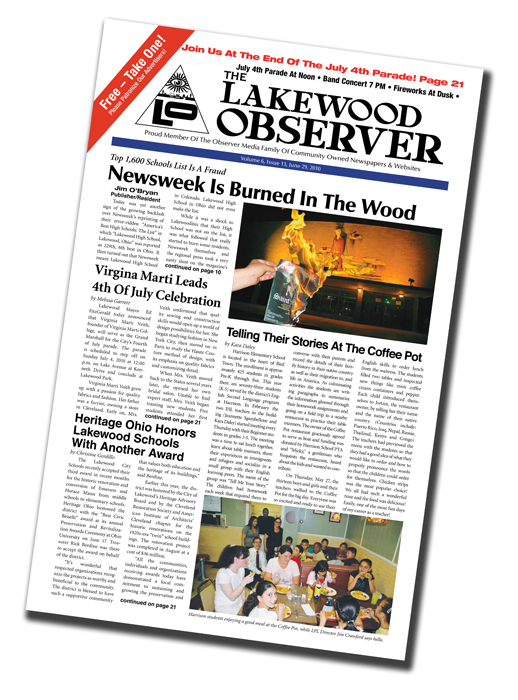 I quickly counted more than a dozen stories about education, schools, students, and teachers in Lakewood. That doesn't even include all of the Lakewood Public Library Events and stories, the announcements about the Lakewood Project performing on the 4th, or even the ad for CWRU (Obviously, CWRU has figured out that Lakewood is a good pond to fish in.). This is ample evidence that Lakewood values and celebrates education, regardless of what Newsweek doesn't have to say about us. Thanks to all of the writers and participants (Special kudos to Chuck Greanoff for his spot-on story.). We are all elevated by your efforts.